The tariffs cover mostly energy and agricultural products but hit everything from goldfish to electric cars. 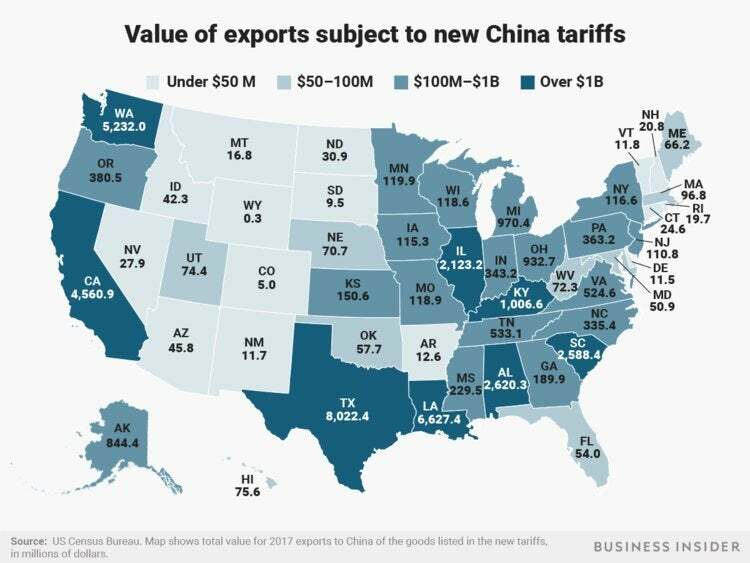 The collateral damage from President Donald Trump's trade fight with China could soon have some states feeling the squeeze. China announced tariffs on $50 billion worth of imports from the US in response to Trump's tariffs on Chinese imports, an escalation of the brewing trade war between the two countries. Also mirroring Trump's move, China's tariffs will be deployed in two waves — the first covering $34 billion worth of goods coming in early July. The Chinese tariffs are focused on energy and agricultural products, covering goods including ornamental fish, whiskey, and coal. By singling out certain goods, the Chinese are also hitting some states harder than others. Many of these states have just a handful of goods that make up most of the coming pain. For instance, $5.6 billion of Louisiana's $6.6 billion worth of tariff-eligible exports comes from soybeans. Similarly for Alabama, $1.7 of the state's $2.6 billion in tariff-eligible goods is soybeans. In Texas, the biggest hit will come from crude oil (the state sent $3.7 billion worth to China last year) and propane, the state sent $1.7 billion worth to China last year.